The New Zealand Curriculum provides students, parents, whānau and teachers with a clear framework for assessment, planning and monitoring students’ progress. This particular project demonstrates the New Zealand Curriculum in practice for students with the highest learning support needs. A number of resources have been developed to assist students to learn and their teams – at home, at school and in the wider community – to support them. This website includes guidance on using narrative assessment for students who are expected to learn long-term within Level One of the New Zealand Curriculum and showcases examples of that assessment approach in practice. The resources available on this website are the Narrative assessment: a guide for teachers and The New Zealand Curriculum Exemplars for Learners with Special Education Needs. 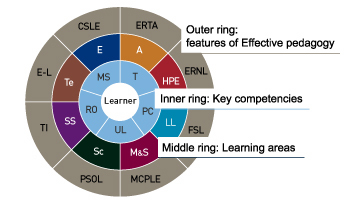 Click here to use the wheel to search the curriculum exemplars on this site. Teachers use a range of assessment tools and approaches, including narrative assessment, to plan effective, individualised teaching and learning programmes for their students. Narrative assessment provides a rich picture of students’ skills, strengths, and learning support needs. It uses learning stories to capture progress in students’ learning, and records the often subtle interactions between the student, their learning environments, their peers, their learning support team, and their learning activities. The use of this information to engage with parents and whānau, allows those who know the child best to collaborate in planning next steps learning as part of the child’s Individual Education Programme and plan. In this way, narrative assessment provides clear and specific reporting about the individual student’s learning, support needs, and progress in relation to the National Standards.